With the magic of changing seasons, the possibilities were limitless! Revive your pleasures and appreciation, and make it last just a little longer this year with our stylish accents! Styled from rugged yet tasteful powder coated steel, and warm, these designs provide lovely accents for your home and tastefully showcase candles, plants, flowers, poinsettias, ornaments, or even incorporate them into your centerpieces! Just remember that your possibilities are still limitless! These promotional products will enhance your home. 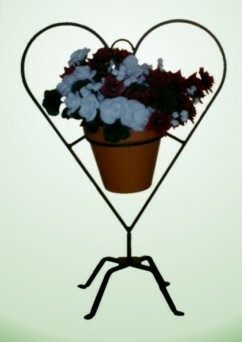 Holds a 10" flower pots and is made back wrought iron strap. 36" tall x 25" wide.